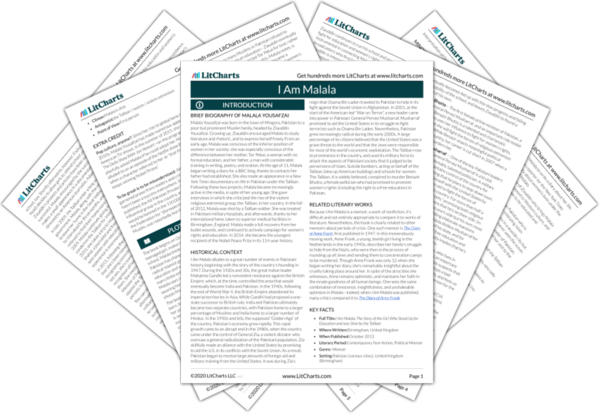 Instant downloads of all 942 LitChart PDFs (including I Am Malala). 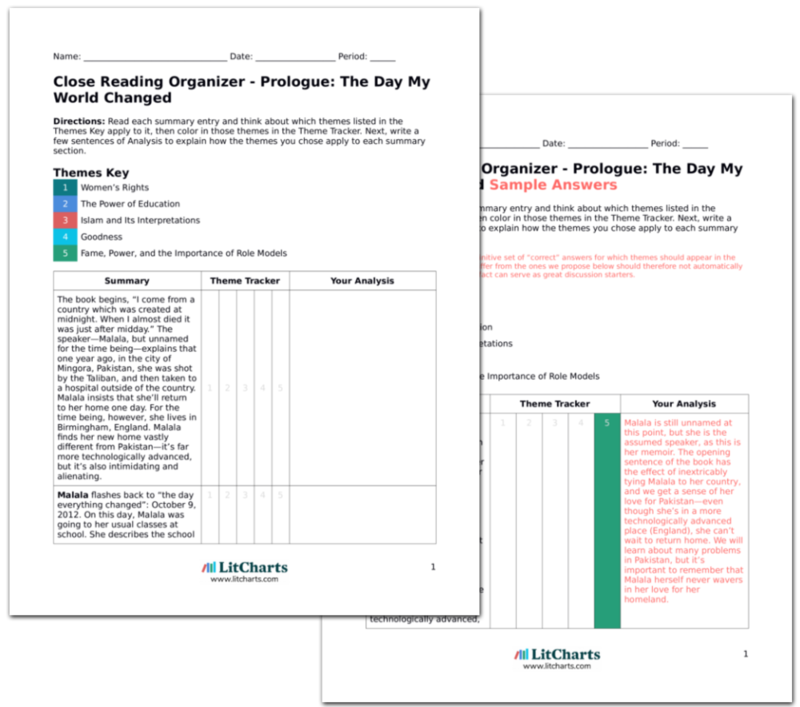 LitCharts assigns a color and icon to each theme in I Am Malala, which you can use to track the themes throughout the work. Malala notes that her mother began and finished school at the age of six. At first Tor Pekai was proud of being the only girl in her school, but ultimately, she couldn’t force herself to continue—she saw her female friends playing every day, and couldn’t convince herself that there was any point to learning. After Tor Pekai married Ziauddin, however, she began to regret her decision. Her husband was extremely knowledgeable, and she couldn’t keep up with him. Largely because of Tor Pekai’s encouragement, Ziauddin founded a school for girls. Malala is close to both of her parents, but in one sense Tor Pekai represents a “cautionary tale,” both for Ziauddin and Malala. When education is discouraged for women, it’s easy for young girls to give in to what’s easier and more fun—not going to school—as they don’t yet have a mature perspective on the importance of education. But missing out on an education often leaves women like Tor Pekai unsatisfied and regretful. Malala explains that Ziauddin’s decision to pursue education and poetry as a career disappointed Rohul. Rohul had wanted his son to become a doctor, but Ziauddin’s abilities in math and science weren’t strong enough. When the time came for Ziauddin to attend Jehanzeb College, the finest school in Swat, Rohul refused to pay for his education—if Ziauddin wasn’t going to become a doctor, he decided, there was no point. Ziauddin feared that, without any further education, he would end up teaching in Sewoor—a typical career path for people in Swat, and not a particularly desirable one for Pashtuns. Pashtuns, Malala explains, look down on the people of Sewoor because of their dark skin. Ziauddin’s decision to pursue education and literature is a bold one, particularly considering his relationship with his father. Again Malala mentions the fact that Pashtuns discriminate against dark-skinned people. This is probably a cultural remnant of colonialism—the belief that whiteness is superior has gradually developed into an inferiority complex and racial hierarchy even in non-whites. Malala is often strikingly realistic about her culture, not shying away from either the positives or the negatives. Malala explains that Ziauddin found a way to be happy, despite Rohul’s refusal to pay for his further education. Ziauddin befriended a friend of his brother-in-law, Nasir Pacha. Nasir Pacha suggested that Ziauddin live with him in Spal Bandi, a beautiful mountain valley. Ziauddin agreed to live there, and there he encountered women who were less repressed and timid than those in his birthplace. With Nasir Pacha’s help, Ziauddin was able to attend Jehanzeb College. In one sense, Malala’s version of Ziauddin’s story is like a prequel to her own story, which we have yet to hear. Like Malala, Ziauddin relies extensively on the kindness of his friends and neighbors. Although it’s tempting to read his life as a story of “one man overcoming the odds,” the reality is that Ziauddin’s life is a testament to the importance of helping other people, and accepting others’ help. While Ziauddin attended Jehanzeb College, many important historical events happened. General Zia died in a plane crash that may have been caused by a bomb. Zia’s successor was Benazir Bhutto, the daughter of the Prime Minister whom Zia had executed. Bhutto encouraged free speech and new student organizations, many of which Ziauddin participated in at college. Ziauddin gained a reputation as a skilled speaker and debater, and eventually rose to become the general secretary of the Pakhtoon Students Federation, an important lobbying group for Pashtun rights. Traditionally, Malala explains, Pashtuns are ignored in Pakistani society—the best jobs and opportunities go to the Punjabis. Throughout this chapter, Malala shows the ways that the events of history influence the lives of individual Pakistani people. Here, for instance, Ziauddin’s career as a public speaker and debater—in essence, a mascot for the importance of free speech—is intimately tied to the rise of Benazir Bhutto. It’s implied, for instance, that Ziauddin would never have been allowed to lobby for Pashtun rights so freely under General Zia—Zia would have sent an army to break up the demonstrations. 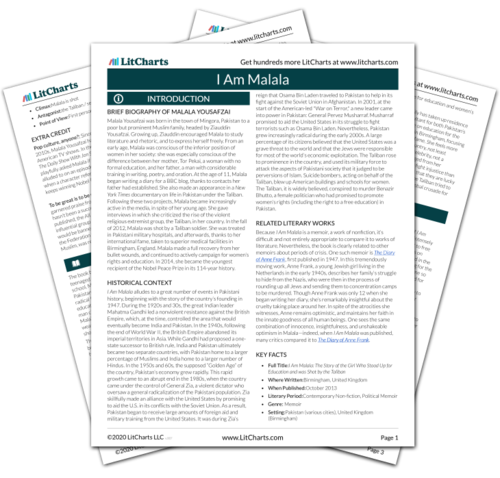 Get the entire I Am Malala LitChart as a printable PDF. Another important event that occurred while Ziauddin was in college was the publishing of Salman Rushdie’s Satanic Verses. In Rushdie’s novel, he parodied details of Mohammed’s life—an act which was considered blasphemous by many Muslims. Quickly, Muslims across India and Pakistan began protesting Rushdie’s book. In Iran, the Ayatollah Khomeini called for Rushdie’s death, and urged all loyal Muslims to help kill him. At college, there was a campus-wide debate on the merits of Rushdie’s book. While most of the students believed that Rushdie’s book should be banned (some even thought that Rushdie should be murdered), Ziauddin argued for free speech and the freedom of expression. He insisted that if Muslims could be so enraged by a simple book, then Islam was a weak religion—the best way to respond to The Satanic Verses was to ignore it. The Salman Rushdie affair is often considered an “acid test” of one’s political leanings. It’s possible to argue that Rushdie was trying to offend Muslims by satirizing the prophet Mohammed in his novel, but it also seems reasonable to say that Rushdie shouldn’t have been persecuted for his right to free speech (especially considering that The Satanic Verses has great literary value, and little real criticism of Islam). Ziauddin chooses a middle ground, acknowledging that Rushdie’s book is offensive, but refusing to believe that he should be hurt for writing it. Ziauddin basically argues that God doesn’t need humans to use violence on his behalf—God can defend himself. The best way to actually convert people to Islam is through reasoned discourse and good deeds, not threats and violence. This idea will be important as Malala defends Islam while also condemning violent extremism. Following his years at Jehanzeb, Ziauddin worked as an English teacher at a private college. He was a good teacher, but the pay was low. He planned to marry Tor Pekai, but found that he didn’t have enough money to do so. One of his coworkers was his old friend, Mohammed Naeem Khan. Together, they planned to found a school of their own, one which would encourage independent thought. The plan turned out to be more difficult than they’d thought, and they were forced to take out costly loans from banks. Although they secured a building for their school, they found that there weren’t enough families in need of English tuition to make ends meet. Malala doesn’t sugarcoat the difficulties of achieving one’s goals. She goes into great detail about the setbacks her father went through when trying to set up a school system in the Swat Valley. Again Ziauddin makes progress because he’s lucky enough to have loyal friends like Mohammed Naeem Khan. Although Malala never says so explicitly, we can assume that Ziauddin and Mohammed want to establish schools because of their passion for free speech and the right to education. As time went on, Ziauddin and Mohammed began to argue. Eventually, Mohammed demanded that Ziauddin give him his share of the money. Ziauddin obliged, reluctantly, and Mohammed abandoned work on the school. Ziauddin began working with another college friend, Hidayatullah. Together, they named their new school the Khushal School, after the poet Khushal Khan Khattak, their mutual hero. At first, there were only three students. Ziauddin and Hidayatullah found it nearly impossible to make ends meet: they couldn’t even afford desks for their three students. Desperate, they turned to Pakistani administrators for government funding. The superintendent of Pakistani schools met with Ziauddin, only to demand a bribe. Ziauddin angrily refused, both because of his Pashtun pride and because he simply didn’t have any money to bribe the superintendent. In this long, important section, we see the ways that Ziauddin deals with complications in his plans. He falls out with his friend Mohammed, but doesn’t let this ruin his goal of building a chain of schools: he values the school project even more highly than he values one man’s friendship. Ziauddin’s challenges are external as well as internal, as he learns that the school system in Pakistan (at the time) is designed to make superintendents rich, not to educate children. Malala makes it clear that Ziauddin’s Pashtun roots lead him to oppose corruption—Malala acknowledges that there are many problems in Pashtun culture, but a crucial part of it is also a fierce commitment to what is right. Frustrated with the slow pace and tiny size of his school, Ziauddin turned to politics to strengthen education in his community. Using his skills as a speaker and a debater, he rose to become the president of an organization called the Swat Association of Private Schools. Ziauddin grew the organization from only 15 members to more than 400. He made money on the side by selling popcorn to children. Somehow, Malala explains, his financial difficulties made his spirits “high.” Ziauddin met with a local TV advertiser and persuaded the man to advertise for his school on television. Ziauddin’s ascent to fame seems simultaneously difficult and easy. We get the image of him selling popcorn to support his schools, but we’re given little information about how exactly his charisma as a speaker and debater translated into greater enrollment in the schools. While it’s a little frustrating that Malala doesn’t give us more information on the subject it’s inspiring to hear that Ziauddin’s failure made him work harder, rather than give up—another aspect of a good role model. In the midst of his financial difficulties, Ziauddin married Tor Pekai. He kept this information fairly private—in Pakistan, weddings are huge, expensive affairs, and if all of Ziauddin’s friends know about the wedding, he would have been unable to entertain them all. Rohul refused to pay large sums for the wedding, meaning that Ziauddin was forced to take out more loans from the bank. Ziauddin bought his wife beautiful gold bangles and other jewels. When he returned to Mingora with his new wife, Hidayatullah was stunned—Ziauddin hadn’t told him about his marriage beforehand. Ziauddin’s relationship with Tor Pekai is unusual in a number of ways. We’ve already been told that Ziauddin married Tor Pekai for love, rather than because his family arranged the marriage. In a sense, Ziauddin’s relationship with Tor Pekai is similar to his relationship with education: he loves both his wife and his schools for the most intimate, personal of reasons—not because of any obligation to. Malala continues describing her parents’ history. Ziauddin, now married to Tor Pekai, set to work improving his new school. Tor Pekai helped out by painting the school and installing lights. Despite the new couple’s happiness and optimism, the school continued to lose money. Ziauddin couldn’t afford to pay his teachers money, and eventually the jeweler who had sold Ziauddin the bangles he gave to Tor Pekai came to Mingora, demanding money. Ziauddin had no choice but to give the jeweler his jewels back—this humiliated him. The school endured more problems: floods, power shortages, and teachers who quit in the middle of the year. Although Tor Pekai isn’t an educated woman, this doesn’t mean that she can’t be helpful to the establishment of the schools in the Swat Valley. As Malala grows up, she learns that her mother was essential in the building of Ziauddin’s schools: she has strong role models in both of her parents. Malala never loses sight of the difficulties that afflicted her father as a young man: he couldn’t even pay for his wife’s jewelry at the wedding. Throughout the difficult early period in his school’s history, Ziauddin remained optimistic. He advertised for his school across the valley. It was during this period that Malala was born. She grew up in her father’s schoolhouse, observing the students and the teachers. When Malala was young, Ziauddin’s friend and partner, Hidayatullah, left the school to found one of his own. Ziauddin accepted Hidayatullah’s departure. This occurred in the latter half of the year 2001. It was during this time that terrorists bombed the Twin Towers in New York—an event that Malala was only dimly aware of. Nobody in Pakistan, Malala concludes, could have predicted how September 11 would change life in their part of the world. The way Malala mentions the bombing of the World Trade Center on September 11, 2001 is almost off-handed—it’s certainly not the focal point of a chapter, or a section of the book. Nevertheless we can sense that 9/11 will “change everything,” both in the United States and in Pakistan. The terrorist attack will usher in a global “War on Terror,” which we’ll read more about in the coming chapters. While to Americans 9/11 was an epoch-defining catastrophe, Malala’s detached perspective on the attack helps remind us that violence occurs in other parts of the world all the time, much of it perpetrated by America itself, and the people affected by it are no less valuable than those lost on 9/11. Arn, Jackson. "I Am Malala Chapter 3: Growing up in a School." LitCharts. LitCharts LLC, 2 Dec 2015. Web. 22 Apr 2019. Arn, Jackson. "I Am Malala Chapter 3: Growing up in a School." LitCharts LLC, December 2, 2015. Retrieved April 22, 2019. https://www.litcharts.com/lit/i-am-malala/chapter-3-growing-up-in-a-school.